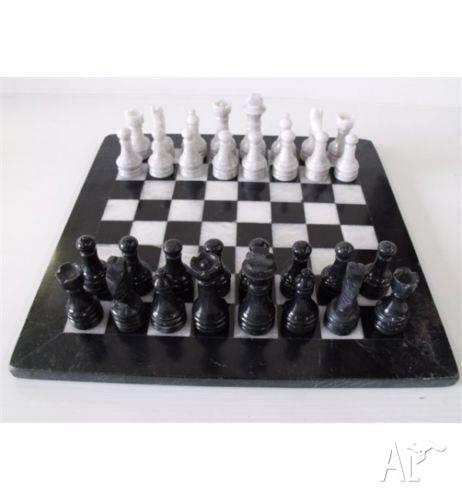 Modeled on the famous Staunton Chess sets this black marble and white marble chess set is a wonderful combination as it creates a sharp contrast of texture and color. The endless variation of the black & white marble makes each chess set unique, therefore no two are alike. Whether for yourself or a gift to someone special, this elegant chess set will prove a favorite that will be treasured forever. •Combined Chess Set & Board Weight: Approximately 16 lbs. 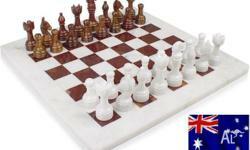 •Overall Size of Chess Board: 12" x 12" x .5"
•Comes packaged in a Styrofoam container that holds chess pieces and chess board individually. Note: As onyx is a natural stone please be aware their will be variations with each piece.Will try to match each ordered piece with that of the display pic. Marble Chess Set Red & White - 12"
Marble Chess Set Red & White - 12" Brand NEW! Excellent GIFT!